After falling prisoner, a bewildered Hanley finds himself both the ally and the prisoner of Baron Friedrich von Strelitz, a Wehrmacht general who is flee Germany. 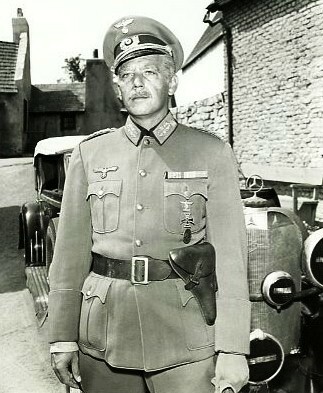 With Hanley in German uniform, the General hopes to reach the Allied lines before the Gestapo catch up with him and arrest him for his participation in the failed plot to assisinate Hitler. I really dislike plotlines that make me feel stupid. I know that scriptwriter Malvin Wald had an important point to make about war and the nature of patriotism. I know, because the dialogue repeatedly said so. I'm just not sure what the point was. I'm unsure why gun-toting children (including the adorable Bijou from the episode "The Little Jewel") suddenly appear out of nowhere, shoot a priest, and then disappear. I cannot pinpoint where the story goes wrong. It has such possibilities: a moral dilemma of a General who must choose between his oath of allegiance and the good of his country, and a daughter who chooses patriotism over familial duty. Near the battlelines, a remorseful and wounded General fears he is truly a traitor and is overcome by his shame at killing fellow Germans. At gunpoint, he tries to force Hanley to return him to Germany. But Hanley refuses, trying to convince the General that what he now views as treason is really patriotism. The General dies before reaching the Allied lines, in limbo between two great armies and still unresolved in his own mind as to whether he is a hero or a coward. 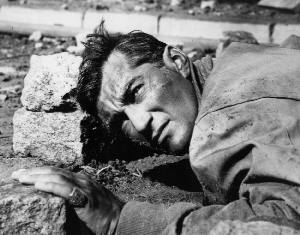 This is the stuff of great tragedy, but "Escape to Nowhere" fails to deliver any emotional impact.  This is Robert Altman's weakest outing as a director for Combat! The direction is ordinary, matching the performances. 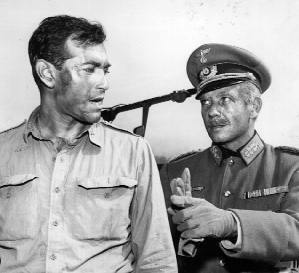 Albert Paulsen as the General (also seen in "Forgotten Front" and "Retribution") looks ridiculous under a garish blonde hairpiece with matching eyebrows and moustache. I was also bothered by the daughter of a prominent General serving as an entertainer in a disreputable dive. Seems improbable. Rick Jason is very watchable in this silly story. His apprehension at passing himself off as a German at the club provide the best moments of the episode. Sasha Hardin, whose first Combat! 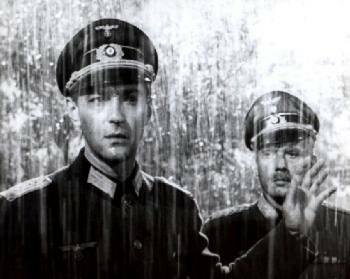 appearance was in the episode "The Prisoner," is wonderfully menacing as the Gestapo agent bent on bringing the General to justice. He and Jason play off each other well in the scene in the club where they both are working at not communicating the truth about themselves to each other. The scene is a beautiful study in playing around an emotion. This episode is among the favorites of producer Robert Blees. He came up with the concept of the episode prior to the show going into production. He says, "They had this wonderful train station and when I toured the lot with our art director it was ramshackle and torn and ruined and all of the tarps had holes in them," says Blees. He said we're gonna have to spend forty, fifty thousand bucks to fix this. But I said, Come on, this is war time. This is a bombed out station. We'll write a story around the set. It was a very very successful one with Rick as the star." The episode, hyped by the network press, was well received and elevated Rick Jason among the female viewers of the show. In the graveyard scene, the rain falls in front of Hanley and the General, not on them. They never get wet. Among the French children is actor Michel Petit, who plays Bijou in "The Little Jewel" and appeared earlier this season in "Missing in Action"